Definition at line 41 of file llmaterialtable.h. Definition at line 57 of file llmaterialtable.h. Definition at line 78 of file llmaterialtable.h. Definition at line 62 of file llmaterialtable.h. References LLStringBase< char >::copy(), LLMATERIAL_INFO_NAME_LENGTH, mDamageModifier, mDefaultTextureID, mDensity, mEPModifier, mHPModifier, mMCode, and mName. Definition at line 54 of file llmaterialtable.h. Referenced by LLMaterialTable::addDamageAndEnergy(), LLMaterialTable::getDamageMod(), and init(). Definition at line 46 of file llmaterialtable.h. Referenced by LLMaterialTable::getDefaultTextureID(), and init(). Definition at line 48 of file llmaterialtable.h. Referenced by LLMaterialTable::addDensity(), LLMaterialTable::getDensity(), and init(). Definition at line 55 of file llmaterialtable.h. Referenced by LLMaterialTable::addDamageAndEnergy(), LLMaterialTable::getEPMod(), and init(). Definition at line 49 of file llmaterialtable.h. Referenced by LLMaterialTable::addFriction(), and LLMaterialTable::getFriction(). Definition at line 53 of file llmaterialtable.h. Referenced by LLMaterialTable::addDamageAndEnergy(), LLMaterialTable::getHPMod(), and init(). Definition at line 44 of file llmaterialtable.h. Referenced by LLMaterialTable::addDamageAndEnergy(), LLMaterialTable::addDensity(), LLMaterialTable::addFriction(), LLMaterialTable::addRestitution(), LLMaterialTable::addShatterSound(), LLMaterialTable::getDamageMod(), LLMaterialTable::getDefaultTextureID(), LLMaterialTable::getDensity(), LLMaterialTable::getEPMod(), LLMaterialTable::getFriction(), LLMaterialTable::getHPMod(), LLMaterialTable::getMCode(), LLMaterialTable::getName(), LLMaterialTable::getRestitution(), LLMaterialTable::getShatterSoundUUID(), init(), and LLPanelObject::postBuild(). Definition at line 45 of file llmaterialtable.h. Referenced by LLMaterialTable::getDefaultTextureID(), LLMaterialTable::getMCode(), LLMaterialTable::getName(), init(), and LLPanelObject::postBuild(). Definition at line 50 of file llmaterialtable.h. Referenced by LLMaterialTable::addRestitution(), and LLMaterialTable::getRestitution(). Definition at line 47 of file llmaterialtable.h. 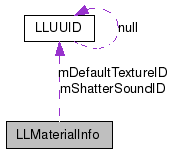 Referenced by LLMaterialTable::addShatterSound(), and LLMaterialTable::getShatterSoundUUID().